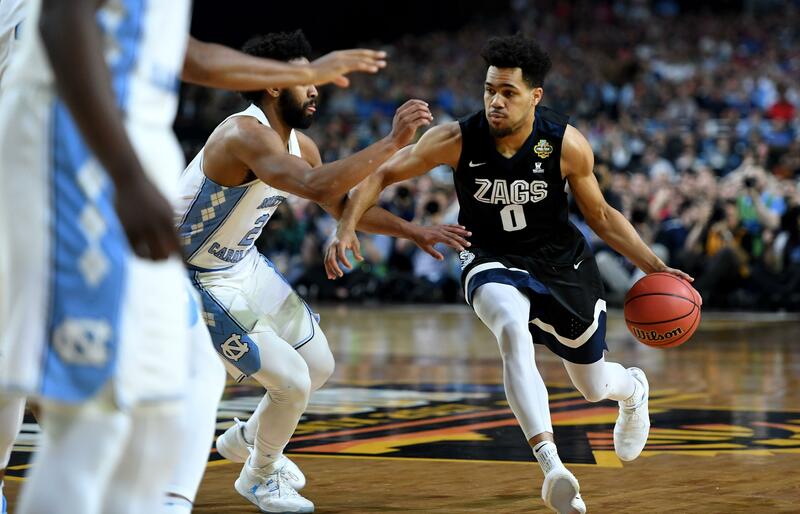 UPDATED: Thu., Nov. 9, 2017, 6:04 p.m.
Josh Perkins didn’t get into foul trouble on purpose in last Saturday’s exhibition win, but it did provide a peek at Gonzaga’s options for backing up the junior point guard. Hint: All-purpose guard Silas Melson figures to be a busy man. Perkins departed with his second foul with 9 minutes, 25 seconds left in the first half and was replaced by Rui Hachimura. No, the high-flying Hachimura didn’t take over at point guard. As expected, that was Melson’s job for most of the eight first-half minutes Perkins sat on the bench. Melson slid over from shooting guard and dished out four assists in 19 first-half minutes. He logged extended time because Perkins was joined in foul trouble by redshirt freshman guard Zach Norvell Jr., who drained a 3-pointer shortly after checking in but picked up three fouls in 46 seconds. “We’re going to have to play some different guys there,” GU head coach Mark Few said. “Josh has to show he can stay in games and play a little bit smarter with fouls. Those two (College of Idaho) guards put a lot of foul pressure on you. Wing Corey Kispert and forwards Killian Tillie, Johnathan Williams and Hachimura are capable ball-handlers. They could also help out against full-court pressure. The Zags dealt with the early foul trouble against the Yotes, extending their lead to 46-31 by halftime, but they’ll need Perkins on the floor as the team’s only true point guard. Gonzaga doesn’t have the luxury of past teams playing two point guards together (Kevin Pangos and David Stockton, Perkins and Nigel Williams-Goss). “A lot of credit to my teammates,” Perkins said. “Me and ‘Snacks’ (Norvell’s nickname) have to a better job of taking those fouls away, we know that, but I never saw (the lead) drop. Melson, whose assist-to-turnover ratio last season was nearly 2-to-1, finished with five assists and no turnovers in 28 minutes. Perkins finished with four assists and one turnover in 21 minutes. Perkins has a career 1.8 assist-to-turnover ratio. The Zags are incorporating several newcomers and returners in expanded roles at both ends of the court. It’ll require time to fit the pieces together, but the first test run was promising. Gonzaga had 23 assists and just eight turnovers in a 96-67 victory over College of Idaho. Published: Nov. 9, 2017, 5:36 p.m. Updated: Nov. 9, 2017, 6:04 p.m.